We are ambitious, but balance it with a collaborative and supportive environment where leadership is accessible and encourages feedback from employees. We are focused on extending the reach of our brands, but never lose sight of our guests, our franchisees and our hard-working team members that drive us into the future. What makes you unique? At Dunkin’ Brands, we’d love to know! We believe that diverse backgrounds, experiences and ways of thinking add immeasurable value to our teams and help drive our brands forward. We are committed to improving the diversity of our employee, franchisee and supplier base and to fostering an inclusive environment for all who come in contact with our Brand. We strive to welcome diverse employees to our teams and to weave inclusion into the fabric of our culture. Our leaders and employees foster an environment where everyone is valued and respected; everyone matters here. 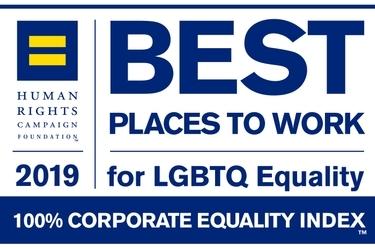 Dunkin' Brands is proud to have earned 100% on the 2019 Human Rights Campaign Corporate Equality Index for LGBTQ-inclusive workplace policies and practices. Women make up 50% of our workforce, and we are committed to ensuring all of our employees are paid fairly for the work they produce. Since our last report, we conducted an internal analysis to validate pay equity across the organization, and in 2016 we made a public commitment to developing and paying women equally: we were one of the 100+ companies that signed the White House Equal Pay Pledge, and we are members of the Boston Women’s Workforce Council’s 100% Talent Compact. Dunkin’ Brands is committed to promoting diversity among our franchisee community. Our Diversity in Franchising Initiative, in partnership with the NAACP, seeks to increase awareness of franchising opportunities among people of color. Through this initiative, Dunkin’ Brands works with the NAACP and other partners to deliver Franchising 101 seminars to state conference leaders from across the country and have hosted hundreds of interested participants to learn more about Franchising as a business opportunity. Community is at the heart of Dunkin’ Brands. We are focused on creating a community amongst our employees where they can learn, grow and follow their passions. We are also committed to giving back to the places where we live and work by providing opportunities for employees to volunteer for causes that matter to them. Through our Joy in Childhood Foundation, Dunkin’ strives to bring the simple joys of childhood to sick and hungry kids. Since 2006, the Foundation has been deeply embedded in communities across the country and has donated more than $11 million to hundreds of national and local charities. For more information, visit Joy in Childhood Foundation. Want to be part of our dream team? We’re hiring! Check out current job openings at Dunkin’ Brands.